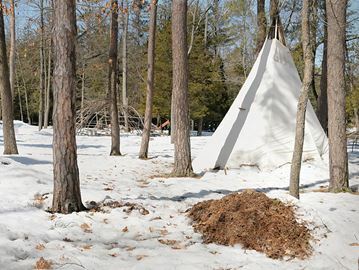 Members of the Beausoleil First Nation plan to return to Springwater Park this spring. The Ministry of Natural Resources is talking with the Beausoleil First Nation about reopening Springwater Provincial Park as a pair of warring citizens’ groups wait to hear if they’ll be included. But while the ministry is “pleased to be working with” Beausoleil, the ministry isn’t yet ready to release details on what’s being discussed, ministry spokesperson Jolanta Kowalski said. As partnership talks began just before Christmas, Camp Nibi — founded by a group led by Elizabeth Brass Elson as an outreach and healing initiative — packed up and left for the winter. Brass Elson plans to restart the group’s activities and ceremonies in the park this spring, although snow still covers the ground in the 193-hectare park that opened in 1927 and was shuttered by the ministry a year ago. Both the Friends of Springwater Park and its offshoot, the Springwater Foundation, however, say they are awaiting dates to meet with the MNR, as $100,000 they both claim to control remains frozen in the bank.